A few thoughts and observations using the Yongnuo RF-602 wireless flash transceiver and receivers. Normally the Canon 5D has a max sync speed of 1/200 of a second, rather than the more usual 1/250, since it has a full frame sensor. When using the RF-602s, the max sync speed is reduced to 1/160 of a second. These numbers may vary depending on your equipment. As a general rule I would recommend to test this before you go out shooting. Especially if you’re using a new camera, a new set of receivers or flashes. 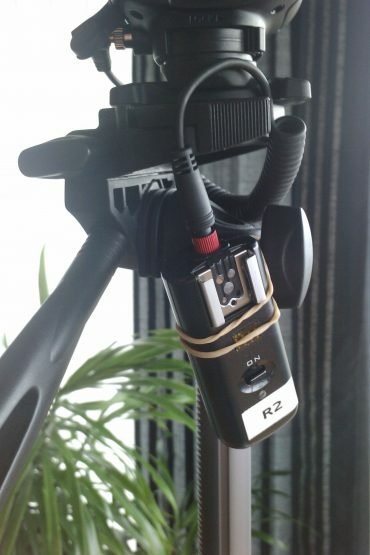 While the RF-602s works more or less flawlessly when the flash is connected using the hot-shoe on the receiver, using a cable (as shown in the image), may result in some strange behavior. In my case, for example, the receiver will no longer be able to wake up the flash from sleep. I’ve tested this on both my Canon Speedlite 580EX II with the same result. This can be solved by disabling the sleep function on the flash unit. Another thing I have observed on a few occasions is that the receivers stop working. I can be resolved by either turning of the flash unit and then turn it back on, or in some cases turn of the receiver and then turn it back on. Again, this seems to be a problem when using a cable instead of the hot-shoe mount. Based on what I’ve written above, you might wonder why I don’t simply use the hot-shoe on the receiver instead of the cable. While connecting the flash unit to the receiver is no problem, connecting the receiver to a mount is a whole different story. Actually, the problem consists of securing the receiver to the mount. And the last thing you want is your expensive flash hitting the ground because your cheap receiver couldn’t hold on to the flash stand. However, if you use a screw (like the one used when connection your camera to a tripod) instead of a hot-shoe mount, this shouldn’t be a problem. The important part is to make sure your flash is secure. Do not compromise.